Speaking while briefing reporters at the Police station in the Khao San area of Bangkok in Thailand, deputy tourist police bureau commissioner, Surachet Hakpal also known as Big Joke in the Thai media, said some Nigerian nationals, who are "Romance Scammers" and preys on gullible Thai women on Facebook, have been arrested in the country on Thursday. 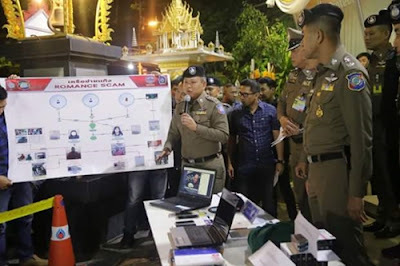 The identified the Nigerians as: Emeka Celestine Eze, 31, and 44-year-old Oliver Obiora, who pretended to be someone else and conned a Khamphaeng Phet woman out of a million baht. He said that the suspects after gaining the confidence and love of a woman, they said they had sent gifts but money needed to be transferred to an account to secure their release from customs. 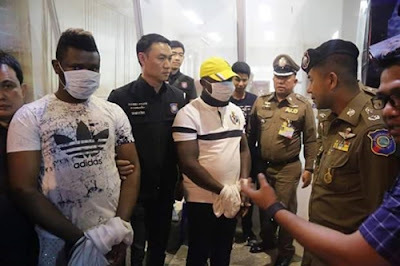 Emeka was nabbed with electronic evidence at the Regent Home Condo in Bang Na while his sidekick, Oliver was taken down while attempting to flee the country at Don Meuang airport. The money they obtained was laundered in the Pratunam area of Bangkok. They were charged with computer fraud, false pretenses, illegal use of ATM cards and Oliver was on overstay too.